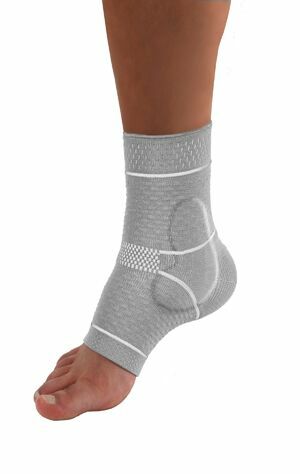 A special knitting technique gives the fabric its anatomical shape to perfectly fit around your AnkleThesiliconecushionsprovidecompression, stabilizetheankle and promoteblood circulation. Aids in relieving pressure, reducing pain and Edema duringsportsandeveryday activity,withoutrestrictingmobility. IndicationsPost-operativeandpost-traumaticirritation, ligamentinstability, jointswelling, painorinflammationaroundthetendonsandmuscles, tendomypathy,distorsions,arthrosis, achillodynia.